Family Yoga is open to children aged 4 and up, teens, mums and dads, grandparents, carers, uncles and aunties. You do not need to be strong, fit or flexible to come, just be prepared to come and take part! Family Yoga offers families important tools to manage the stresses of daily living. Focusing on all aspects of wellness, including physical and emotional, Family Yoga can support physical health and positive mental health for the whole family through games, postures, simple meditations and an overall feeling of calm and relaxation. Family Yoga also embraces the whole family's sense of fun, imagination and creativity, and helps you to connect in a different and peaceful way. Booking in advance is required as places are limited. Investment is £15 for one adult and one child, £3 for additional children/adults. Family yoga continues into 2019 and I am excited to be sharing this practice with some lovely families! Day to day life can be hectic and busy for many families. This class offers the whole family a chance to press pause, slow down, move, breathe and restore body and mind on a Sunday afternoon. Family yoga is open to everyone- children aged 4 and up, teens, mums and dads, grandparents, carers, uncles and aunties. You do not need to be strong, fit or flexible to come, just prepared to take part, enjoy, calm and connect. Family Yoga is a fantastic opportunity to connect and have fun as a family. Family yoga is open to everyone- children aged between 3-12, teens, mums and dads, grandparents, carers, uncles and aunties. You do not need to be strong, fit or flexible to come, just prepared to take part, enjoy, calm and connect. So do come along and enjoy 90 minutes of precious family time with Sally. Book in advance or drop in on the day. So do come along and enjoy an hour of family time with Sally. Book in advance or drop in on the day. Investment is £5 per person. Family yoga continues into 2019 and I am excited to be sharing this practice with some lovely families! Day to day life can be hectic and busy for many families. This class offers the whole family a chance to press pause, slow down, move, breathe and restore body and mind on a Sunday morning. Family yoga is open to everyone- children aged 3 and up, teens, mums and dads, grandparents, carers, uncles and aunties. You do not need to be strong, fit or flexible to come, just prepared to take part, enjoy, calm and connect. Investment is £5 per family member. The class will be held in Nuffield Health Didsbury. You do not have to be a member to come along. Full details and bookings are available through my Workshops and Retreats page. Family Yoga is open to everyone- children aged 3and up, teens, mums and dads, grandparents, carers, uncles and aunties. You do not need to be strong, fit or flexible to come, just prepared to take part, enjoy, calm and connect. Family Yoga offers families important tools to manage the stresses of daily living. Focusing on all aspects of wellness, including physical and emotional, Family Yoga can support health development as well as a sense of fun for the whole family through games, postures, simple meditations and an overall feeling of calm and relaxation. So do come along and enjoy an hour of family yoga time with Sally. Booking in advance is required as places are limited. Family yoga continues in Didsbury and I am excited to be sharing this practice with some lovely families! From May this class will be in our lovely new location of Loving Pilates. Day to day life can be hectic and busy for many families. This class offers the whole family a chance to press pause, slow down, move, breathe and restore body and mind on a Sunday morning. “Accept everything about yourself - I mean everything. You are you and that is the beginning and the end - no apologies, no regrets.” Clark Moustakas. Full details of this morning workshop and bookings can be found on my Workshops and Retreats page. Looking for a later evening class to start your week with some yoga? We will move through a sequence of postures always starting and ending in meditation or relaxation in order to calm the body and mind. Opportunities for sun salutations, standing and seated postures, as well as backbends and inversions. If you would like to build strength and flexibility with a sense of steadiness and ease then a warm welcome awaits. I am so excited to be launching a new autism-friendly special yoga class in partnership with Transcend Therapies, encouraging mindfulness and relaxation tools for children with autism. These sessions are for children aged 4+. There will be a maximum of 8 children in each session so booking is essential. Parents are welcome to stay or to drop off and collect at the end of the session. The class will include yoga movement, breathing practices and relaxation, with a focus on grounding and body awareness. Yoga is so beneficial for children with autism. As well as building strength, balance, coordination and flexibility, these classes will offer an opportunity for children to be themselves and learn about awareness and expression of emotion within a safe space. Yoga can support the reduction of anxiety and the soothing of the nervous system. The class will be facilitated by Sally, a children's yoga teacher and educational psychologist, with 7 years experience of working with children with additional needs. Please message for any queries about the class. A drop in price is available for your first class only. After this investment in a class pass is required. 3 class passes must be used with 6 months, and 6 and 9 class passes must be used within a year. Yoga is for everyone- you’re never too young to start. 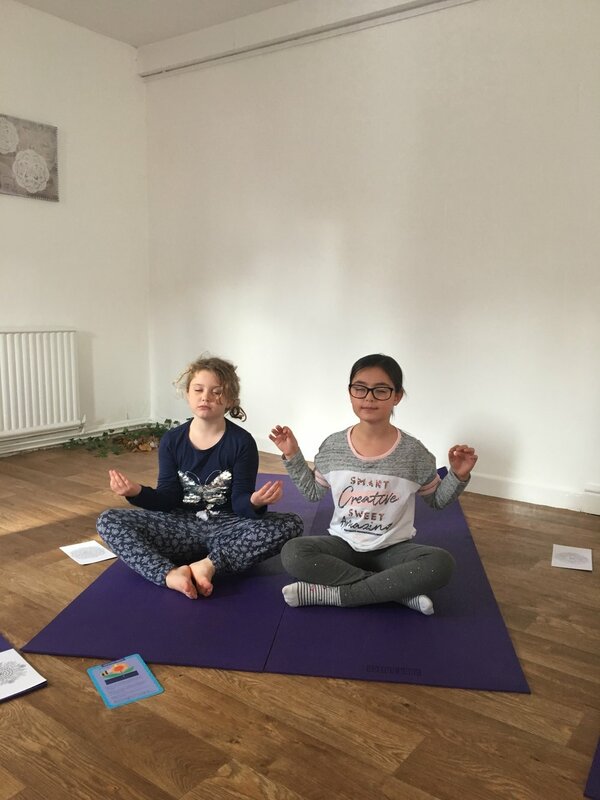 This is a brand new opportunity at The Ki Retreat for children to access yoga and mindfulness with a qualified children’s yoga teacher and educational psychologist. For more information and bookings please visit my ‘Courses, Workshops and Retreats’ page. Join Emma and Sally for a Yin Yang workshop, the perfect way to celebrate the Autumn Equinox, the equal day and night, and welcome the new season. In Eastern philosophy, everything is made up of a balance of yin and yang; feminine and masculine, light and dark, quiet and loud, strong and soft. The tendency in the Western world is to live in a ‘yang’ culture, which means we often risk reaching burn out. In this workshop we’ll offer a practice to honour the transition from summer days to cooler autumn as the sun moves further away from the northern hemisphere. You can expect a perfect combination of yin yoga, a slow, grounding and contemplative practice, and yang yoga, a more dynamic and energetic practice to heat the body. You will have opportunities to build strength and to deepen and explore your practice and knowledge of yoga, but also time to rest, restore and relax. Expect to be challenged but to leave feeling energised and balanced. There will also be journalling and meditation practices, as well as vegan snacks, teas and sweet treats to end the workshop.